The Fisher Denture and Dental Care website is designed to appeal to potential patients who are looking for a reliable and affordable prosthodontist in the Fayetteville, Arkansas area. The website is light and bright, combining a traditional menu bar and layout with modern elements, such as video and interactive map integration. On the home page, the upper navigation bar seamlessly blends into the header image, which is followed by an image-based secondary menu that spotlights specific services, such as denture repair and dental implants. Visitors are given a brief welcome and an introduction to Dr. Fisher and then given the opportunity to schedule an appointment and find directions to the practice. The remainder of the website includes information about the office and services, as well as answers to patients’ most frequently asked questions. Because prosthodontists perform surgical procedures, we chose to create this website with the traditional medical blue and white hues that all patients are familiar with. This well-known color choice helps visitors feel more comfortable with the credentials of the office while also providing a calming effect for those who may feel nervous or apprehensive about upcoming dental treatment. 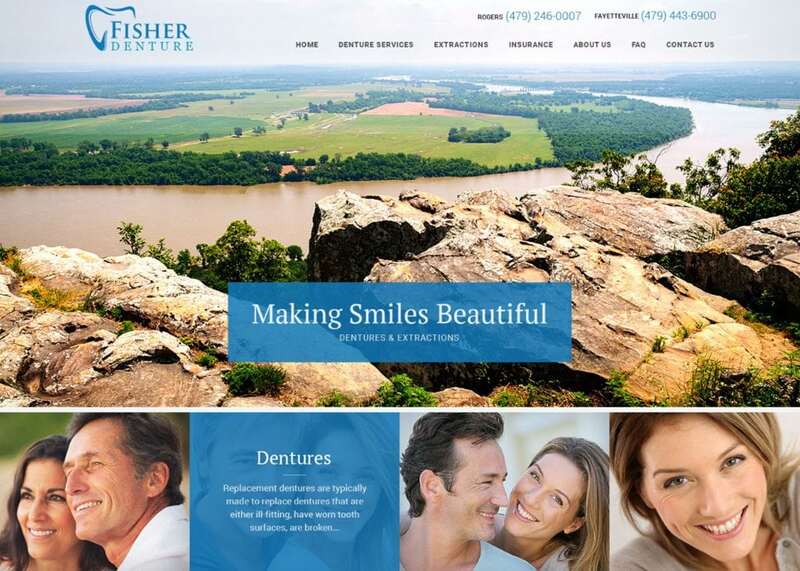 This website features scrolling scenic imagery at the top of the home page allowing Fisher Denture and Dental Care to customize or change the images that appear to site visitors. This is also a highly visual prosthodontic website that utilizes images for aesthetic purposes, as well as to delineate a functional and responsive menu for the center of the home page. To diversify the content for this custom web design, we also implemented an entire page specifically for dental education videos. Local online prosthodontist marketing should reach two types of people – potential patients and their referring physicians. That is why we created a website that functions across multiple viewing platforms, including mobile and desktop devices. We also created multiple opportunities for appointment requests, as well as responsive phone numbers to each of the practice locations that can be used for in-app calling. Finally, we placed links on the home page that redirect to the practice’s social media accounts. This allows existing and potential patients to remain informed as the practice provides updates. This website is has a calm and professional image. It appeals to potential patients in the area with beautiful images of a well-known local vista on the home page. All of the pictures depict smiling, satisfied people who are happy with the beautiful and healthy-looking teeth they enjoy. Ultimately, we hope this site will portray the office as friendly and reliable, converting site visitors into new patients for many years to come.